We went to Dutch X-mas Con last week and again I bought some very nice DVDs. One of them being “The Church” released by Shameless Screen Entertainment. The Church is an Italian horror film from 1989 directed by Michele Soavi (Deliria, Dellemorte Dellamore). Since I just decided a while ago I want to collect all of the Shameless DVDs this was a very nice find (I also got “Who Saw Her Die?”). Also, I’ve never had seen this film but I read some good things about it. The film starts off in medieval times. A whole village is accused of witchcraft and heresy. So a group of religious knights slaughters the whole village. This scene is very intense and has a crazy part where some woman gets her head chopped off and horses just keep walking over it. The camera just stays focused on the head while the knights are going around killing people. This goes on for quite a while and is very disturbing. After that, all the villagers get buried in a mass grave and a big stone cross gets laid on top of it. A big church will get build on the grave to prevent the demons from coming out. After that, we switch to present day. The church’s librarian Evan (played by Tomas Arana) accidentally opens the mass grave. Now the demons get unleashed. A group of visitors gets trapped in the church. Strange and evil things start to roam the church and people are getting possessed. Like a lot of Italian horror films of this time the movie can sometimes be all over the place. Which makes it kind of hard to describe and summarize. Some scenes feel very dreamlike and have a kind of Argento-esque feel to it. Which of course isn’t too strange since Dario Argento was the producer and co-writer of this movie. All this I think is very positive, since I love Argento’s films. Well, actually more of his earlier work that is haha. Overall the movie isn’t extremely gory, although it definitely has some gore in it. And the kills that are there are very brutal. The scenery and atmosphere in this film are just great. The old cathedral is just an awesome location for a horror film. I also love the soundtrack in this movie. It really sets the mood and also creates a great atmosphere. Shameless did a superb job with this one again. The movie is 2k restored and HD re-mastered. Also, it is the longest version released. You can watch the film in English or Italian with English subs. Which I think is awesome since most DVDs of this kind of films only have the English dubbing on it. And like other Shameless releases the DVD has a reversible sleeve. 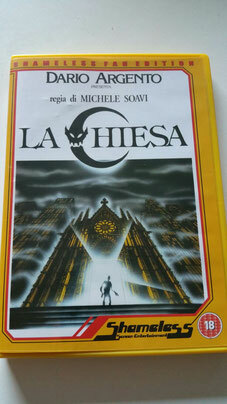 Both artworks is just awesome and I like that one sleeve has the original Italian title “La Chiesa”. Also, the DVD has a unique interview with director Michele Soavi. This interview is about 25 minutes long and was very interesting to watch. Michele tells about his history with Dario Argento, the making of this film, the filming locations, his inspirations and vision and a lot more. I just love this kind of extra’s on DVDs. The movie looks fantastic. Shameless did a great job on the re-master. Also, the sound is great as well. It is very clear. I only watched the Italian version with subtitles so I don’t know how it is for the English version, but I can’t imagine it being bad. The DVD also features some trailers of other films released by Shameless. I love the DVD starts with these trailers, it reminds of the good old VHS renting days. Like my other Shameless DVDs I have, I’m very glad to have this in my collection. You can see that the people from Shameless have a lot of love for this kind of films. And I have to compliment them that they still do DVD releases and not just Blu-ray, or DVD/Blu-Ray combo packages (I’m sorry buy I just don’t like the Blu-ray cases). They also released The Church on Blu-Ray so If you want an even better picture quality or are a Blu-ray collector you could go for that one. I will just stick to collecting DVDs. And I will be looking forward to the next Shameless release which is also a Michel Saovi film: The Sect.